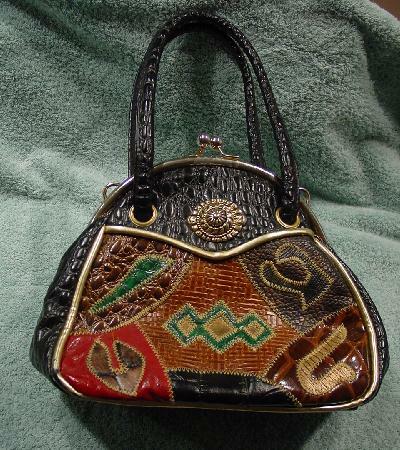 This vintage purse is made from manmade materials. 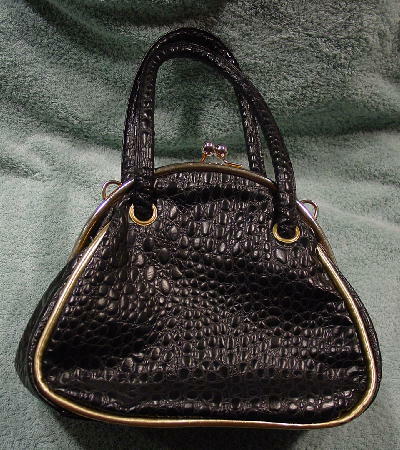 It has a black faux crocodile background and handles. The front has a patchwork design of crocodile, alligator, weave, and reptile patterns with a sewn patch in various shapes in the center. They are in light and dark brown, black, green, red, and gold-tone. It has a textured, elevated gold-tone ornament. There is a gold-tone cord, bypass closure, two loops, and gold-tone rim around the patchwork. The gold-tone on the front bottom is worn off. There is also a gold-tone cord in the back with some gold missing. It has a thick black fabric lining, one interior zippered pocket, and 2 padded handles.